Last summer, undergraduate student Chris Carr spotted a “smudge” on deep sky images taken from the university’s Burrell Schmidt telescope at Kitt Peak National Observatory in southwest Arizona. It was so faint he hardly saw it. But he flagged it for Astronomy Professor Chris Mihos, with whom he’d been working the past two weeks, and explored the coordinates further. 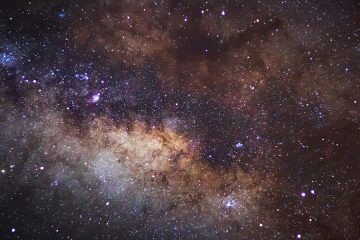 What they found pointed to the detection of a new galaxy about 37 million lightyears away. Their research paper, titled “BST1047+1156: An Extremely Diffuse and Gas-rich Object in the Leo I Group,” was recently published in The Astrophysical Journal Letters, with Carr as the second author. When Carr was 6 years old, his family moved to Strongsville, Ohio, a suburb of Cleveland. On his first day at his new school, the students were sent to the library to find books to read. Most of his classmates gravitated toward more age-appropriate selections. But Carr wasn’t interested in fairy tales or the likes. He explored bigger, more technical books, eventually settling on one on Venus. “The words flew off the pages,” Carr said. He remembered it catapulting him into a new, vast and expansive universe. Throughout his elementary school years, Carr’s reading selections were almost exclusively related to space. In time, he idolized the scientists about whom he was reading. Now it feels “surreal” to him to have contributed to the field so early. Listeners of WRUW-FM 91.1 may be familiar with Carr, who’s hosted his own show on the Case Western Reserve University radio station. His show, Enter Galactic, tackles some of life’s most vexing questions from the origins of the universe to the existence of aliens. Growing up, Carr always had thoughtful conversations with family and friends—at times extending into morning hours. Enter Galactic is inspired by those late-night sessions, though now the discussions are with Case Western Reserve faculty and experts. Though Carr will take a hiatus from the show this fall, he expects to continue these deep conversations on-air again in the spring. 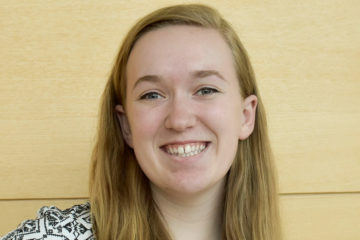 “Working with WRUW has been an amazing experience, and I certainly hope to continue scientific outreach in some form after I move on from Case [Western Reserve],” Carr said. Find out how Carr answered this week’s five questions. Cleveland’s the only big city I’ve ever known. I’ve always felt it strikes a nice balance. It’s not brimming over with people like a New York or a Chicago, nor is it completely in the middle of nowhere. It’s very accessible, filled with diverse communities and subcultures, and possesses a city pride that I’ve always found quite endearing. 2. What’s a hidden skill or talent you have that most people would be surprised to know? Since my early teens, I have been an avid writer. Over the years, I’ve written several novels—of varying quality—that exist at the intersections of science fiction and fantasy. Some I’m very proud of, while others will never see the light of day. There’s this stereotype that scientists are all these cold, logical machines who are incapable of appreciating the finer things such as the arts or the humanities, but, at least for me, my studies in science have been a profound source of literary inspiration. I’ve had several amazing teachers throughout my educational career, but for my time at Case [Western Reserve], I’d have to say my favorite was Dr. Bradley Ricca. He was my instructor for the Imagination Project, my first semester SAGES seminar. It still amazes me how he was able to take a group of 20 or so wide-eyed freshmen, and nurture such a friendly and inclusive environment in his classroom. Ask anyone who was in the class with me and they would certainly agree. It would certainly be the Apollo moon landings! Revolution was in the air in the 1960s. Every corridor of society you can think of—civil rights, gender roles, science, art, politics, music—was entering uncharted territory, and I think the moon landings and space exploration really exemplified that radical change. It forced humanity to reorient its relation to the universe, to the Earth, and I think ultimately to itself. For the first time in human history, we truly saw ourselves in the stars. There was this bright optimism about the future and conquering its looming challenges that I think we’ve lost. It’s so small! You see the same people every day when you’re walking to class and when you’re walking home. Its quaint size makes it a lot easier to sustain meaningful relationships with friends and faculty.